LONDON — President Trump has offered the British prime minister advice on Brexit. The president’s son said this week that she should have followed it. It is unclear what expertise Mr. Trump has in British and European politics and government, or whether Britons care about what he has to say. But his views appear to align with his father’s. During a visit to Britain last summer, President Trump told Mrs. May to “sue the E.U.,” according to her account of the meeting — advice the prime minister dismissed in favor of negotiating. “She laughed it off,” Mr. Bannon told the British network Sky News on Monday. After a series of defeats in Parliament, it has become clear that Mrs. May will try to postpone the March 29 date for Brexit to take effect — a move that appears to have disappointed President Trump. Plenty of Britons would dispute the claim that anyone is in control in London, where Mrs. May has been tripped up by one Brexit dispute after another. 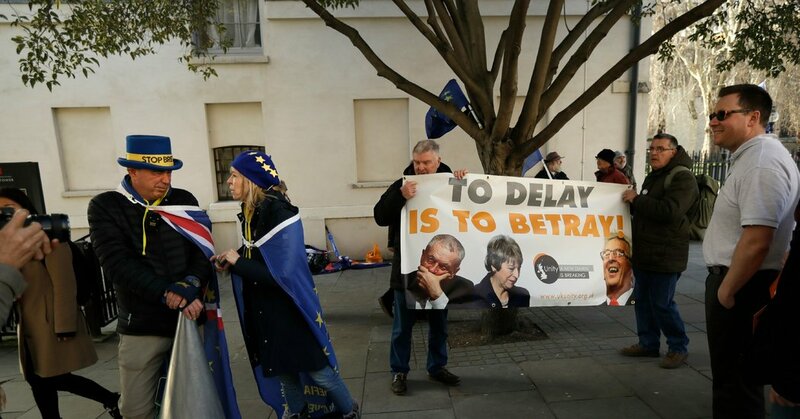 The notion that puppet masters in Brussels are pulling the strings might come as a surprise to European officials who have been exasperated by Britain’s paralysis. “What we’re seeing now in Washington, London and Brussels is the desperate, last-gasp attempt by those previously in power to cling on to what was once theirs in the face of an overwhelming mandate for change,” he asserted. In a referendum in June 2016, Britons voted 51.9 percent to 48.1 percent in favor of leaving the European Union. But many details of the break became clear only in the negotiations that followed, and recent polls have shown that a referendum held today might reverse that result. Just five months later, the senior Mr. Trump won the presidency, despite losing the popular vote to Hillary Clinton, 45.9 percent to 48 percent.